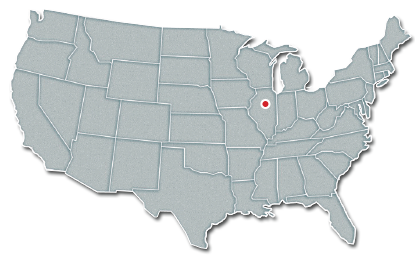 Located in Mendota, Illinois, the Ridley Feed Ingredients plant is a highly specialized facility that focuses on blending very low inclusion vitamin and trace mineral premixes that other Ridley plants use in further manufacturing. Ridley Feed Ingredients also contract-manufactures a wide variety of unique products such as feed additives for resale by pharmaceutical companies. RFI’s customers include large integrators or other feed companies. The Ridley Poultry Services business unit is one of the leading suppliers of vitamin and mineral premixes and consulting services to the poultry industry, and the Ridley Specialty Products business unit is a leading private label manufacturer of small package nutritional supplements. In addition to its product mix, RFI is unique in that it markets to customers throughout the United States and Canada. Because its products are typically used in very small amounts per ton of finished feed and are generally very expensive, they can be freighted relatively long distances—in some cases even internationally. RFI has years of experience in micro-ingredient manufacturing, distribution and customer service, providing consistent, high quality products and reliable service to its customers.